See Isonychia for details. It is the only North American genus in this family. 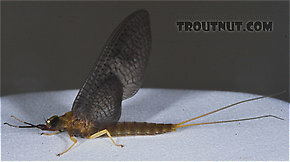 Some Isonychia species are multibrooded, but not in the same way as most other multibrooded mayflies like the Baetidae. 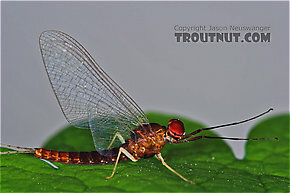 In those species, the flies emerging in midsummer or Fall are the offspring of the earlier hatch from the same year. In Isonychia, the Fall emergers are offspring from the previous Fall. 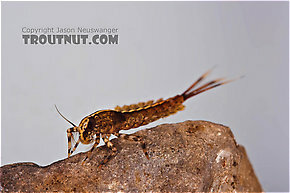 They are present as half-grown nymphs when the first of their generation emerge. Although Isonychia broods have distinct peaks, some may be found on the water at any time in between. I'm curious if they can really be called multibrooded or not, since they don't produce more than one generation per year (as far as I know). They simply have distinct populations within the same generation which emerge at different times during the year. Does that count? All my books are packed up in boxes right now so I don't have a technical definition of the term handy. There are 2 more topics.